Thomas Muller insists Leroy Sane will be a major factor in the future of Germany's national team. Sane was left out of Germany's ill-fated World Cup campaign in Russia despite helping Manchester City to a record-breaking Premier League triumph in 2017-18 and winning the PFA Young Player of the Year award. The 22-year-old was back in Joachim Low's squad for the Nations League opener against world champions France, even though he has only made three substitute appearances for City this term and was left out of Pep Guardiola's matchday 18 for the 2-1 win against Newcastle United last time out. A late cameo during last week's 0-0 draw in Munich was followed by Sane leaving the squad for the birth of his daughter and missing the 2-1 friendly win over Peru. 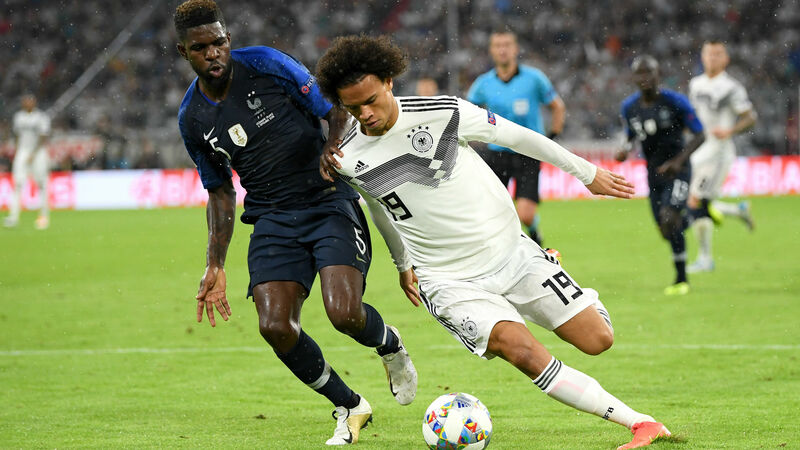 Prior to the France match, Real Madrid midfielder Toni Kroos raised eyebrows by questioning Sane's attitude, but Muller has no such doubts over the former Schalke youngster. "He's an exceptional player with abilities that only very few bring," the Bayern Munich star told Sport Bild. "I think Leroy is now mature enough and I trust him a lot for the future. "It's up to us to help him produce his best performances in the national team. All players are required, not only Leroy." Debate over Sane's performances and attitude for Die Mannschaft have come against the backdrop of a historic under-achievement in Russia. Muller rejected the notion that their group-stage exit was down to disharmony within the squad and the lifestyles of certain players. "We all know that every player has a life of his own and a different lifestyle," he added. "We have clearly spoken to each other as to whether this issue is responsible for disharmony and disruptions and we questioned ourselves. "In our view, that was not the case."